A cleft lip and/or palate can cause significant obstacles for children's speech. However, though cleft lips and palates are fairly common around the world, the general population is often unfamiliar with these birth defects. Below are some basic answers to frequently asked questions about cleft lips, cleft palates and speech. 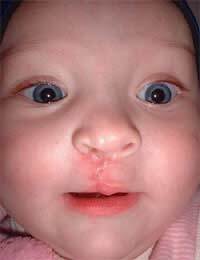 A cleft lip is a birth defect in which the soft tissues of the lips did not grow together during pregnancy. This cleft usually looks like a space or gap between the skin of the upper lip that extends vertically up to the nose. In general, boys are affected by cleft lips more often than girls are affected by cleft lips. Cleft lips can be present alone or in conjunction with cleft palates. A cleft palate is a birth defect in which the soft tissues of the palate did not grow together during pregnancy. This means that there is often an opening left between the roof of the mouth and the nasal cavity, though some children may experience clefting at both the front and back of the palate while others may only have partial clefting of these tissues. Regardless, a cleft palate means that the tissues at the top of a child's mouth haven't fused properly. More girls than boys have cleft palates only (without cleft lips as well). How Does a Cleft Lip or Palate Affect Speech? Cleft lips and/or palates often cause children to have speech problems, though with surgery and therapy a significant number of these children can overcome or adjust and have fairly normal speech abilities by about age five. Speech delay is common in children with clefts, and many children learn to make vague sounds such as grunts instead of actual words when they have trouble speaking. Cleft palates in particular lead to speech problems as the top of the mouth is not available for the tongue to hit in order to make specific words and sounds. Also, because children with cleft palates can not close off their nasal cavities during speech their voices often sound highly nasal. Such children may also hurt their vocal chords by putting excess pressure on them as they try to build up enough air pressure in the mouth to speak, and they may become fatigued while talking for similar reasons. Will Speech Therapy Help Those Affected by Cleft Lips or Palates? Children with cleft lips and/or palates often have surgery to try to correct these birth defects but speech therapy is important as well. Speech therapy can help these children unlearn the "bad" habits that they developed in order to cope with their clefts. Nasal speaking, articulation problems and speech delay can all be helped by speech therapy. Further surgeries may also be available to help with speech problems. Where Can We Learn More About Cleft Lips, Palates and/or Speech? Cleft lips and palates can often be diagnosed during prenatal ultrasounds or are visible just after birth. This means that parents can immediately ask their midwives and doctors for more information. As children with clefts grow, GPs and consultants can offer more information about their health and speech. Speech and language therapists can also offer more information on cleft lips, palates and/or speech.